On January 25, Ms Jacinta Maina took her five-year-old granddaughter to a private hospital in Kenya to have her decaying tooth removed. But what was meant to be a quick and ordinary tooth extraction procedure turned tragic. The nursery school pupil now has a 30 millimetre needle stuck in the soft tissue of her left gum. Ms Maina vividly recalls how her granddaughter’s problems started. Ms Maina and the child arrived at Pope John Paul II Huruma Health Centre in Nanyuki at around 12pm. The girl was ushered in the dental room, but as the dentist administered anaesthesia, the needle broke. Ms Maina noticed that something had gone wrong when the dentist struggled with the child for about 20 minutes, and her screams grew louder. “All of a sudden, the doctor panicked. The girl was crying as the doctor tried to locate something in her mouth. I asked if the needle had broken, but no one answered,” she said. All this time, Ms Maina, was assisting a nurse to restrain the girl. The dentist then left with girl and went to a separate section of the hospital, leaving Ms Maina confused. About 15 minutes later, the dentist returned with an X-Ray. He broke the news that a needle was stuck in the minor’s gum and handed Ms Maina a referral letter to Nanyuki County Referral Hospital. Huruma Hospital through the legal officer of Catholic Archdiocese of Nyeri, Father David Mutahi, admitted that the incident had happened. At the county hospital, doctors said they could not handle the case, and they advised Ms Maina to take the child to Kenyatta National Hospital (KNH). “When I was told about going to KNH, I knew the situation was bad. I wrote a message to her mother, who works in Meru, asking her to meet us in Nanyuki town,” says Ms Maina. For Muthoni, that call by her mother marked the beginning of long hours in hospitals for the next four months. Disturbed by the turn of events, Ms Maina reported the incident at a police station, but police advised her to go back to Huruma Hospital. When she went back to the facility, she says doctors were hostile and did not respond to her queries, insisting that only KNH could handle the situation. “I told them we could not go to KNH because we did not have fare. I refused to leave because they were responsible for what had happened, and yet they were not giving a way forward,” says Ms Maina. She says she demanded to see the hospital’s administrator, Sr Luciah Jura, who admitted that a mistake had happened, and reassured her that the child would be assisted. Ms Muthoni arrived and the family was given accommodation at the hospital. The following day, the hospital facilitated the mother and her child’s transport to Chogoria Mission Hospital in Meru. The girl underwent a four-hour surgery, but the lead surgeon was not able to remove the needle. But according to Ms Muthoni, doctors told her the needle had been removed. “I asked them to show it to me but they refused, insisting it was no longer there,” she says. But reached for a comment, Dr James Kirimi, who conducted the surgery, said after the operation, he briefed Ms Muthoni and told her they had not removed the needle. Later, the child developed complications from an infection on the gum. Ms Muthoni took her back to the hospital, where the same doctors recommended another operation. She was required to pay Sh15,000. However, fearing that the second surgery would not be successful, she refused to have her daughter operated on. A week later, she consulted a doctor at Nanyuki General Hospital, who advised her to conduct another X-Ray to confirm whether the needle had indeed been removed. The X-Ray confirmed that the needle was still in the gum. The matter was later referred to Consolata Mathari Mission Hospital in Nyeri. 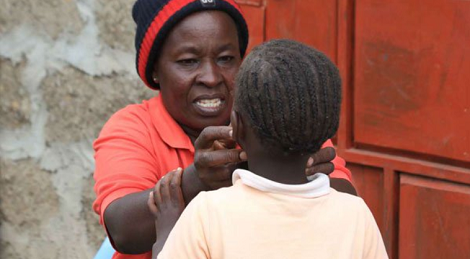 On April 17, Ms Muthoni was advised that the needle should not be removed until a time when there is prove it might be posing danger to the child. The hospital’s CEO Bernard Muriithi said a maxillofacial surgeon ruled out the girl’s life was in danger due to the presence of the foreign object. “I have been through a lot of trouble and pain, and spent a lot of money because of this unnecessary operation that was done on my child. I want justice for my daughter. She did not attend classes in first term, and she is distressed,” said a tearful Ms Muthoni. » Stop Using Toothpick After Eating - Nigerian Dentist Warns.